* THE BOL & THE BSTREET BAND. I know that some of you guys like to follow Jeff Eats and Mrs. Jeff Eats’ social calendar- with that in mind- tommorow night starting around 6pm you can catch us at the Seminole Casino Coconut Creek, 5550 Northwest 40th Street, Coconut Creek, Florida 33073, (954) 378-7850. ***** The Bol, 5550 Northwest 40th Street, Coconut Creek, Florida 33073, (954) 378-7850. 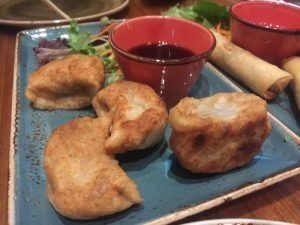 Got an absolutely dynamite Chinese/Vietnamese joint for you guys to checkout- The Bol located in the Seminole Casino Coconut Creek in Coconut Creek. Last night Jeff Eats, Mrs. Jeff Eats, Daughter Jeff Eats and Son jeff Eats “discovered” The Bol and after applying Jeff Eats’- Brooklyn Jewish American Chinese Food Taste Test Circa 1957- I gotta tell you guys- that this joint is turning out some of the most delicious Chinese food that Jeff Eats and Mrs. Jeff Eats have had during our 27 year South Florida residency! As for The Bol’s Vietnamese dishes, no expert here- but like its Chinese stuff- absolutely delicious! Simple concept working here- booth/table/hi-top/counter seating, open kitchen, almost reasonably priced (hey!- the joint is in a casino and I’m kinda thinking that something like 70% of the people that eat at The Bol- use “points” to pay for their food- thus the “non-local-neighborhood prices) menu of Chinese and Vietnamese dishes, super pleasant service, open Sunday-Thursday 11:30am-1am/Friday & Saturday 11:30am-3am. Trust Jeff Eats on this one, The Bol is an absolute homerun! Forget that it doesn’t have Early Bird Specials and Combo Plates and all kinds of Dinner Deals- the few extra bucks you’re gonna spend (that’s assuming you don’t use “points”) to eat there won’t kill you- or require you to get a second job…and I’m telling you- that you will absolutely love the food! You guys can check menu/prices/info at CasinoCoco.com. Trust Jeff Eats when I tell you- THE BSTREET BAND is one of America’s best- Bruce Springsteen & The E Street Band- tribute acts! The Seminole Casino Coconut Creek (Thursday, 1/17/19 7pm) & Seminole Hard Rock Casino/Hotel- Tampa (Saturday, 1/19/19 8pm) shows are complementary. Tickets for the SWFL Event Center- Bonita Springs (Wednesday, 1/16/19 7pm) show can be be purchased at swfleventcenter.com. If you’re into THE BOSS, you gotta go see these guys! Ive eaten in The Bol and the food was delicious. 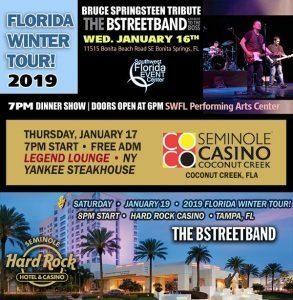 Ive also seen The BSTREETBAND a couple of times, once at HR in Hollywood and once at the Seminole Casino CC and they are really good. Their lead singer looks like Bruce and the band does some really good covers. A few years ago the band played our CC in Delray Beach. They are terrific. My wife and I are coming to see the band. We will either eat in The Bol or NYY. Saw the band at the Mizner CC in Delray a few years ago. They put on a great show.